The Maui Medical ID Bracelet is at once sparkling and subdued, dramatic and understated. 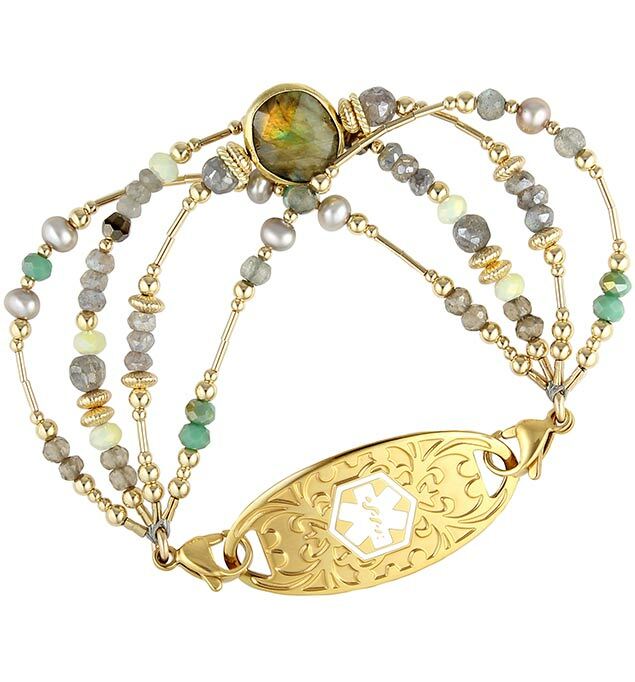 This handmade, beaded medical alert bracelet features four complementary strands of freshwater pearl, mystic labradorite, grey moonstone, smoky quartz, and yellow gold. The multi-faceted crystals and detailed gold accents balance beautifully with the hand-gold-leafed labradorite center stone for a look that pairs perfectly with any custom-engraved Lauren’s Hope medical ID tag. As with all of our interchangeable designs, you can wear the Maui Medical ID Bracelet with any custom-engraved Lauren’s Hope medical ID tag, keeping what’s truly most important to you right at hand. This on-trend med ID is a great choice whether you wear your medical alert bracelet for epilepsy, lupus, hypothyroidism, Alzheimer’s, vision impairment, or any other medical condition or treatment consideration. Custom engraving allows you to choose the look you want so you can stay safe in style. This bracelet is suitable for everyday use including hand washing and bathing.